The Owl Cushion was created by the design team of Alberto Lievore, Jeannette Altherr and Manel Molina for the Italian design label Arper. Arper is known for its innovative designs in furniture and home accessories that are always highly functional while displaying an expressive lightness of touch. The Spanish studio Lievore Altherr Molina was founded in 1991 and takes a multi-disciplinary approach to its design work, keeping creative control of everything from first drawings to packaging concepts. The studio has received many accolades, including the prestigious National Design Award of Spain. 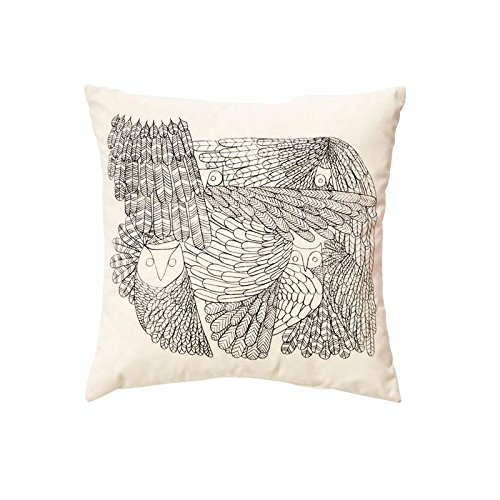 With its square dimensions of 47 x 47 cm and the graphic starkness of its two-tone design, the Owl Cushion fits with any decor and furnishing scheme in both bedrooms and living rooms. It works on its own or blends perfectly with other cushion designs for comfortable evenings on the sofa. The outline of an owl has been taken and deconstructed into a design that cleverly blends the realism of feathers and wings with abstract geometric shapes. The Owl Cushion is made from a Kvadrat Remix fabric and the plain reverse side has an open-weave texture. The filling is a mix of down and fibres.